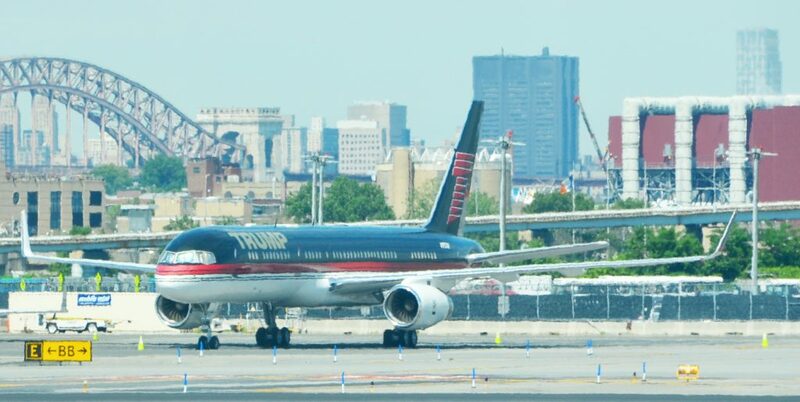 President Donald Trump’s private jet, an instantly recognizable Boeing 757 used during his campaign, was caught up in a quintessential New York City traffic mishap at LaGuardia Airport on Wednesday: a fender bender while someone else was trying to park. A corporate jet maneuvering into a parking spot clipped the wing of Trump’s parked plane around 8:30 a.m., Trump’s company, The Trump Organization, confirmed. The plane was parked and no one was on board, it said. The corporate jet, a twin-engine Bombardier Global Express, had three crew members aboard. It had just completed an 18-minute flight from Islip, on Long Island, and was being guided by ground personnel along a ramp near the general aviation terminal. Trump used the jet throughout his 2016 run for the White House but hasn’t done so since taking office, opting for Air Force One instead. The extent of damage to the planes wasn’t immediately clear. According to the aviation tracking website FlightAware, the corporate jet flew Wednesday afternoon to Hartford, Connecticut, where Bombardier has a service center. Trump’s plane is blocked from being tracked on the site. Trump bought his jet, a retrofitted commercial airliner, from the late Microsoft co-founder Paul Allen in 2011 for $100 million. It was previously used by a low-budget Mexican passenger carrier. Trump flexed the jet as a symbol of wealth, power and convenience during his presidential campaign, using it to commute almost every night to New York, home to his Manhattan penthouse apartment. The plane — painted black and red, with the Trump name in big, gold letters — features a bedroom, 24-karat gold-plated fixtures and leather seats. During the campaign, it became known as Trump Force One and was a familiar backdrop for Trump’s airport hangar rallies. Lately, the plane has turned into something of a LaGuardia landmark, with fliers snapping photos from passing jets and posting them on social media. Wednesday’s incident wasn’t the first involving a Trump campaign plane at LaGuardia. A Boeing 737 charter plane carrying then-vice presidential candidate Mike Pence overran a runway while landing in the rain on Oct. 27, 2016, about two weeks before the election. No one was hurt.